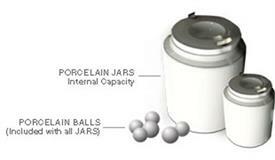 Shimpo's One to Ten liter Porcelain Jars are available to fill your milling needs. Every jar comes with the porcelain balls needed for milling. Select the size jar that is right for you! Extra Milling Balls are available separately.